Two Weeks after my Quicklift | Pam Talks! One thing I’ve learned during this process is to not count the minutes and keep your eyes on the goal. I’m seeing and experiencing that goal in as little as two weeks! Dr. Henry Barber has been the utmost professional. I’ve seen his attention to detail and genuine concern not only for me but for our other patients that walk through the doors of The Martin Center…no matter how minor the issue. He has answered every question and assured me of every concern. Above all, he did a wonderful job. 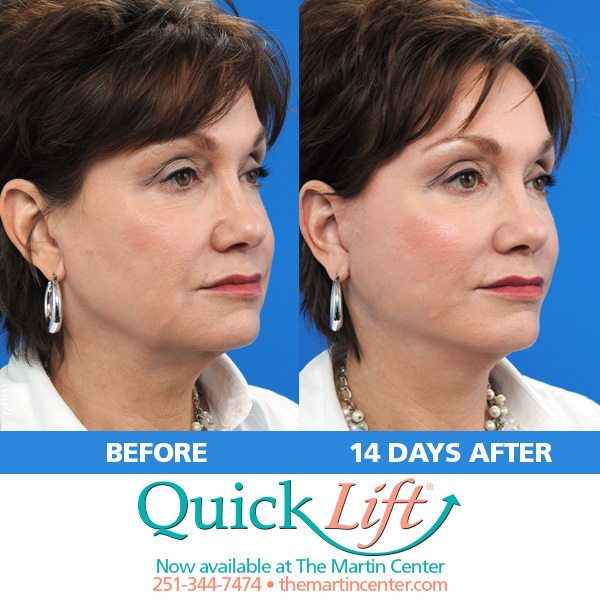 I love the results of my Quicklift. I’d do it again in a heartbeat and highly recommend Dr. Barber. Also, the nurses are so nice at The Martin Center. The clinic nurses helped me understand my home care and the OR nurses were so kind during the surgery. The warm blankets used during the surgery made me feel like I was at the spa for a day and not having surgery! Our nurses are really the best in my opinion. I enjoyed taking a few days off from work and took the time to follow the post care instructions given to all our patients. I understand to a greater degree what it is like to look in the mirror and wonder will the swelling ever go down! Ha! 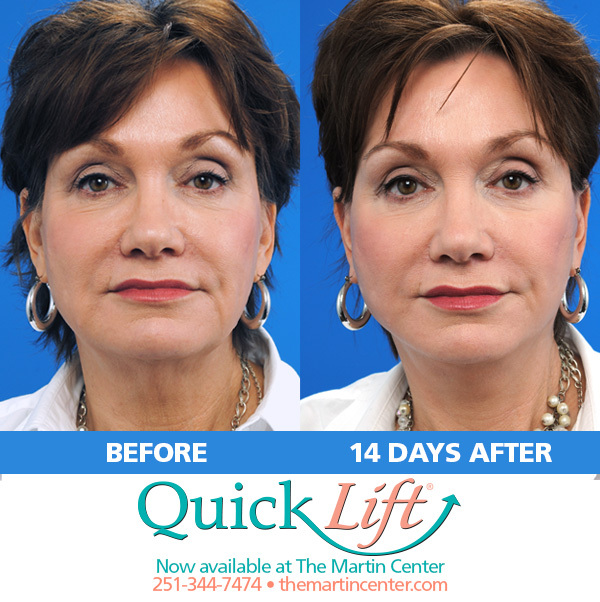 Yes I had those common questions most patients have but I can honestly say everyone at The Martin Center has been great and again I would recommend Dr. Barber to anyone looking to achieve a younger appearance. Would I do it again? Absolutely! A big “thank you” to Dr. Stephen Martin, I love working at The Martin Center! Feel free to give me a call at the office any time at 251-344-7474. 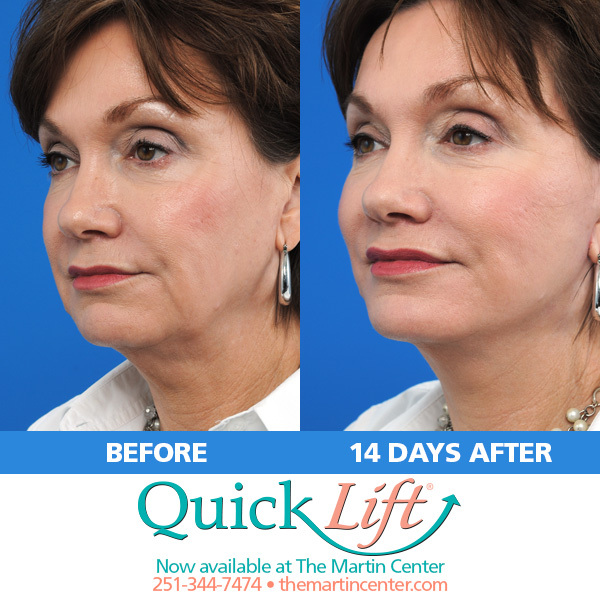 I would love to personally share my experience with you and help calm any concerns if you are thinking about a face lift or other treatment. Don’t wait another day to choose to look younger! The QuickLift is working for me! I will post another update on my QuickLift with pics in about 4 weeks.